This was my favorite piece of swag from E3 2012. 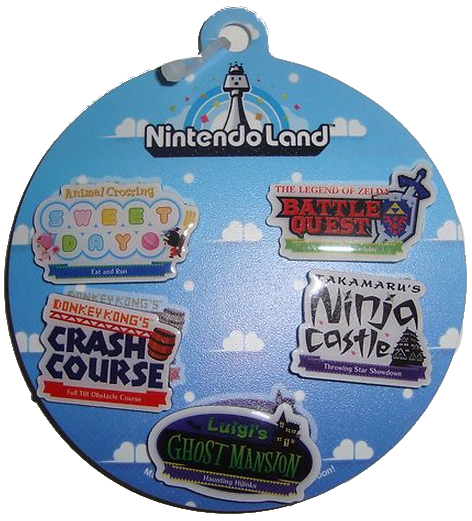 You had to play all five Nintendo Land demo games on the show floor and find the elusive booth babe with the backing (She wasn't that elusive but she never seemed to be near the game itself which would have been the logical spot to hangout). The games were fun to play and adding the element of collecting made it a bit more of a reward for playing them all. Crash Course and Ninja Castle were the hardest to get because they were only 1 player demos, which made the lines about 30-40 minutes each. Apparently, I'm not the only one who liked these pins. They are selling for $50-60 as a complete set on eBay.